Wildcat Ski Area "Wet Ditch Skim Contest"
Wildcat Mountain Ski Area, in Pinkham Notch, NH, held their annual "Wet Ditch Skim Contest", in which skiers & snowboarders attempted to skim across a water-filled ditch without getting wet. The event was held on Saturday, April 3rd, 2010. 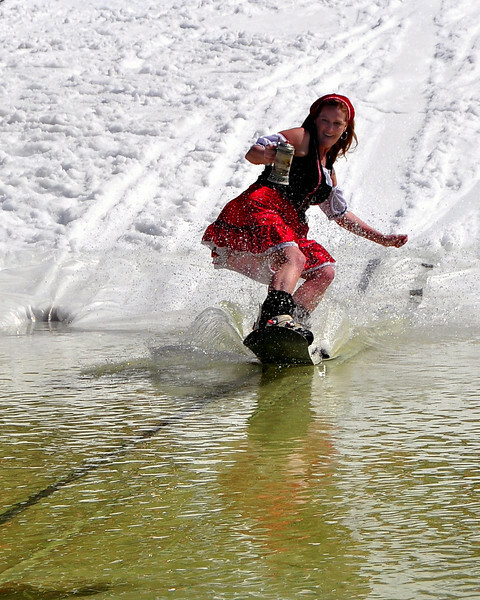 Dayne Callum, of Salem MA, and the Brettl-Hupfer Ski Club, of North Conway, NH, attempted to cross a pond on her snowboard while dressed as an Oktoberfest waitress, during Wildcat Mountain Ski Area's annual "Wet Ditch Skim Contest, held Saturday, April 3rd, 2010. Skiers & riders attempted to carry as much speed as possible to skim across a water-filled ditch, at the base of the Pinkham Notch ski area, in Jackson, NH.